Jet Jurgensmeyer has appeared on many of our favorite shows and has also been very active with his music career as well. We get a chance to speak with Jet about his role on “Last Man Standing” as well as his music career. Learn how Jet got started in music and about his work with The Ryan Seacrest Foundation. If our fans remember we also spoke to Jet previously when he was a bit younger, and you can find that interview here. New song and video “A Lot More Love” available now. Currently starring as Boyd Baxter on the FOX hit show Last Man Standing. Debut single “Everything Will Be Alright” available. Track “Just Another Moment Away” was co-written by Sabrina Carpenter. Television credits include: “CSI: Crime Scene Investigation,” “Hot in Cleveland,” “Grey’s Anatomy,” “Austin & Ally,” “Black-ish,” “Will and Grace,” and more. Film credits include: “Legends of the Hidden Temple,” “Adventures in Babysitting,” “Devil’s Knot,” “The Little Rascals Save the Day,” and “Woodlawn.” Voiceover credits include: Nickelodean’s “Bubble Guppies” and “Shimmer and Shine.” Avid supporter of The Ryan Seacrest Foundation and has raised over $15,000 for them. BSCKids: Tell us about you character on “Last Man Standing” and how it is working with Tim Allen? Jet Jurgensmeyer: Well, Boyd is 12 and about to be a teenager. He has a great relationship with his Grandpa (played by Tim). He likes working on things and the outdoors. He is like most kids and starts to not like school so much. I think you will see his character more and that he is just like any other teenager out there dealing with teenage issues. Tim is the best. What you see on TV is really him. He is just so funny all of the time. He has been great to work with and so nice to me. He treats me like an actor and not just a kid. I really appreciate that. BSCKids: Do you have anything in common with your character on the show ? Jet Jurgensmeyer: Yes, I love the outdoors and working with my Dad on things. I am really close to my Grandpa just like Boyd is. I also am dealing with stuff any other teenage boy deals with like school, friends, parents, girls….the normal stuff. BSCKids: How did you get the role ? Jet Jurgensmeyer: I auditioned and had callbacks and more callbacks. It went on most of the summer and then I was really fortunate to get the big call. I really love it! I couldn’t ask for a better group of people to be around every day and I am learning so much. BSCKids: What would be one thing people would be surprised to know about you? 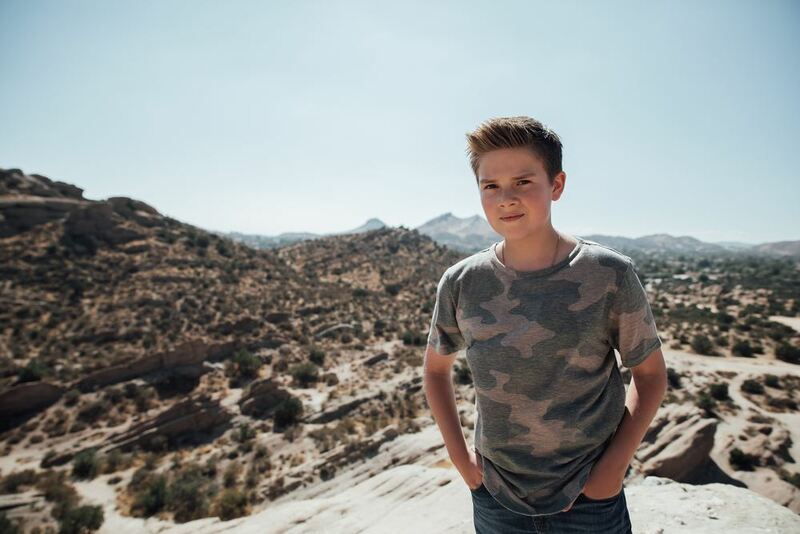 Jet Jurgensmeyer: Hmm….not sure….maybe that a lot of the time spent on set I am doing school. People sometimes think that you just get to show up on set, hang out, and do your scenes. I actually have to do my school just like other kids and then do my scenes also. It just makes you use your time wisely and learn to get your school work done so you don’t have to do it later. BSCKids: Who do you feel has taught you the most in your career? Jet Jurgensmeyer: My parents have taught me the most. I am pretty lucky to have them in my corner. They have been around business and the entertainment industry for a long time and they work really hard to help me get to do what I love. BSCKids: If you could guest star on any show which one would it be and why ? Jet Jurgensmeyer: I would love to be on “Jay Leno’s Garage” and I told him that. I hope we can make that happen. Jay is so cool and has the most amazing cars. He knows so much about them and is just fun to talk to about cars and all sorts of stuff. When he is on “Last Man Standing” he comes by my school room every day and will visit and we talk cars. BSCKids: You have done some voice over work has well, do you find it easier or harder doing voiceover work? Jet Jurgensmeyer: I have done both for a long time. Some people might think voiceover isn’t like live action, but I find it just as exciting. I guess it is easier that you don’t have to get into wardrobe and hair and makeup, but it still can be challenging. I really enjoy it! There are so many really big actors that do voiceover work and people don’t even realize it. Like Mark Hamill does a bunch of voiceover work, people think of him as Luke Skywalker from “Star Wars,” but would be shocked to see how much voiceover work he has done over the years. Live action and voiceover are both fun, they aren’t really like work. I just love getting to do both and have been fortunate to work with great directors and actors in both. It’s pretty cool when you film in front of a live audience though. You get an immediate reaction and know if the joke worked or not. BSCKids: Tell us about you music career and what you have just released. Jet Jurgensmeyer: I actually started off in music. My parents owned a restaurant and we had live music. I started getting on stage at 3 years old. So far I have released 3 songs and videos “Everything Will Be Alright”, “Just Another Moment Away” and “A Lot More Love.” We just recently shot my next video for the song “Real World” (Sabrina Carpenter is also a co-writer on it). All of the songs I have released have been really important to me and have a good message. Jet Jurgensmeyer: Actually, Sabrina was one of the writers on the song. Her mom had the idea that it might be a good song for me. I heard it and loved the feel of it. I was really happy when I took my version over to her house for her to hear she was just as excited as I was. She is always really supportive. BSCKids: Would you rather have a famous career as a singer or an actor? Jet Jurgensmeyer: I certainly don’t worry about fame. That’s why this is a tough one for me. I love them both the same. They are both really important to me and I hope I am lucky enough to always do both. I always say I would love to connect the two through a musical. That would be awesome! BSCKids: Tell us about your work with The Ryan Seacrest Foundation. Jet Jurgensmeyer: I started going to visit their studios a little over 2 years ago. I immediately fell in love with the organization and the group. It just feels so good to go there and visit with the kids. It may only be for a little while, but when those kids come into the studio they are just kids. It isn’t about their illness. It’s about being in there and all of us being together having a good time. It is probably the most rewarding thing I have ever done. Jet Jurgensmeyer: I am pretty much on all social media. I put out new songs on my You Tube channel pretty often too. Thanks goes out to Jet for talking with BSCKids!